In 1329 the men of Wakefield completed the almost entire re-build of the parish church in the City center. 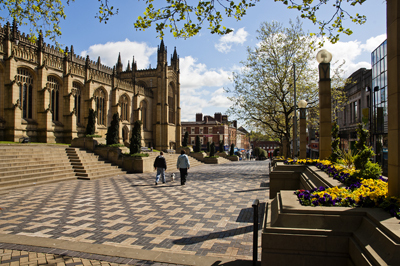 The cathedral stands on the site of a Saxon church in the centre of Wakefield. Evidence of the Saxon building was discovered in 1900 when extensions to the east end of the building were made. In 1090 King William II gave the church and land in Wakefield to Lewes Priory in Sussex and shortly after that a Norman church was built. Up to the 16th century the church was known by the Anglo Saxon All Hallows and after the Reformation changed to All Saints. 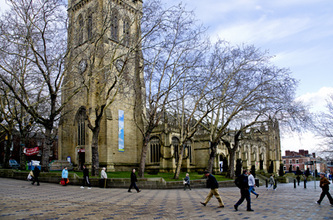 In 1888, the Diocese of Wakefield was created and All Saints church became the cathedral of the diocese. Unusually, it still serves as a parish church meaning that until 2000 the head of the chapter of canons was called the provost, rather than the dean. In January 2000 a parish boundary change brought the chantry chapel on Wakefield Bridge into the care of the cathedral. 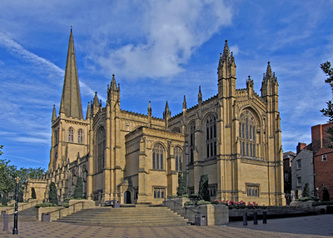 The cathedral was built in the perpendicular gothic style in the early 15th century and restored to its late mediaeval appearance between 1858-1874 by Sir George Gilbert Scott in ashlar sandstone. The north aisle is the oldest part of the church, the north wall dates from about 1150. The chancel a transept and chapel were built at the east end in 1904 to designs by John Loughborough Pearson and completed by his son, F L Pearson. old election posters on the back of the pews platforms.